Yes, you read it correct. Hutch is now available in both 2G and 3G networks! Sri Lankan mobile operator Hutch (Hutchison Whampoa Company) launched their new 3G network (GSM 2100) which allows the company to provide high speed broadband internet services to their customers. Broadband internet services are available in both postpaid and prepaid basis. Hutch 3G provides 7.2 Mbps HSDPA downlink speed and a 5.76 HSUPA uplink speed. Any Hutch customer can activate these 3G services to their connections by calling to 1788 from any network. Goooodak hodai hutch 3g eunna eka. Habi speed 10.5mbps tibbanam..
Actually we provide support within a certain legal framework and set of business ethics. Therefore currently we cannot answer your problem. But you can easily find lots of free solutions out there. use dc unlocker for unlock this hutch 3G dongle. This is the speed what i get in Rathmalana in Off Peak (after midnight) hours, http://www.speedtest.net/result/20601487..
hutch wala APN eka mokakda pls? Hutch APN settings found here: http://mobilebroadband.gishan.net/entry/..
live streaming channels cant watch using a hutch connection on my android device… what is the problem???? Can you provide us your current settings and the Android version to check this? previously hutch late night pack IDM speed 400 kb/sec,500 kb/sec now days its too slow only 90 kb/sec but HSPA full signal.in day time hutch give full speed about 500kb/sec.when it comes to midnight i think they limit their speed.its better to switch Dialog. is the hutch faster than Airtel? hutch 3g data speed eka hodatama aduinee,aaa,srilankawatama dunnata signal,hodatama slow nee,aaa,borunee apata kiyannee ,aaaa,mobitel new speed eka,dual cariyar systam eka apata labaa denna,ok,ok,ok,3g full data speed 21mbps apata labaa denna.ok,2013 year wala 4g data full speed ekak labaa denna,ok,ok,ok. Bilal putha – actually Mobitel is slower than Hutch in some areas. so it really depend on where you are in all, but still Hutch had better signals further away from their towers unlike most other networks, plus I think mobi is putting a speed limiter, cause even with HSDPA signal when downloading the speed was only a bit better than traditional Narrow Band. Mobitel Nam Wadak ma Na. Radawana Base St6ation (In Gampaha) Eke Kawama Dakawath Internet Use Karanna Ba. Aduma Gane Hotline Call Kalath Wadak Na. Mama Nam Hamotama Kiyanne Mobitel Ganna Epa Kiyala. Internet Use Karanawa Nam Hodama Etisalat, Hutch Network 2ka Witharamai.. Airtel 3G Coverage Madine. Main Towns Wala Witharak Nemeine Customersla Inne. Gamatath Thiyenna One.. Colombat Kiri Gamata Kakiri Thamai..
Gampaha – Radawana, Kirindiwela, Yakkala Wage Area Ekaka Inna Kenek Nam Kawama Dakawath Mobitel Ganna Epa. Dialog Gannath Epa. Airtel 3G Nam Thama Coverage Nane. Gannawanam Hutch,Etisalat Ganna! Mama Dialog,Mobitel Use Karanne 2002 Idala. Dan 2014 Wela. Namuth Dialog,Mobitel Network Dekatama Ada Wenakam Kawadawathma Coverage Eka Wadikaranna Planing Division Ekata Ba. Mama Hithanne Nidi Athi. Habai Welawata Bill Eka Nam Ewanawa. Oya Network 2kama 4G Dunna Kiwwata Aththatama 4G Nemei. 4G Kiyanne 1000mbps Speed. Ehema Nam SLT ADSL Nam Hodai. Oya Mobitel,Dialog Wage Company Customers la Rawattana Ekane Godak Karanne. 3.5G Kawadawath Oya Network 2ke Gampaha Side Eke Na. Town Eken Pita Giyama 2.5G Thamai. 4G Kiyala Dila Thiyenneth Broadbrand Speed Eka. Thanikara Boruwa. 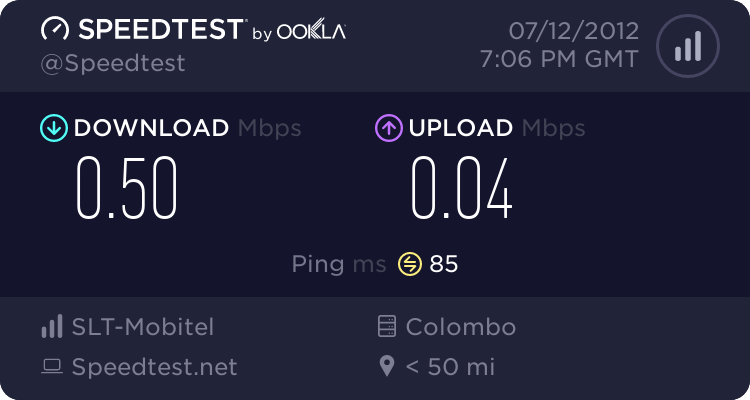 Speed Test Ekak Karala Baluwama Therum Ganna Puluwan.. Very unfortunately to inform you that Hutch has started cheating public and do “Day Light Robberies” to its customers. In fact today I did not use my dongle at all. On 7th I purchased 330MB for Rs.89/= on 7th but that also I did not use since I had no time to use my lap top at my bungalow, cos I was every day late to come in the night. And today when I connected at 8.00pm, I was received a message (08.04.33) saying that I have 43.5 MB balance available for use. As it is coming to be in the weekend, I send my driver to the town and got reloaded Rs.198.00 to got 1GB at 09.25.56pm today (14th). So no sooner I connected at 09.29.44pm, I got a message saying that I have only 917.07MB. But you all can understand that logically I should entitled for IGB + 43.5MB = I.0435MB..OK..
A little while ago, I contacted Hutch customer care number 078 5785785, and got connected to an English customer care person. To the surprise, he could not give me a prompt answer to my question and he cut the line, and at the time of writing this, he is not answering. The conclusion, I hate that cheating the PUBLIC by reputed companies like HUTCH. Whether we use or not a different story.. Once paid… they must keep to their word and give us our genuine entitlement of Data. OVER TO YOU…… THE CUSTOMER CARE MANAGEMENT OF HUTCH…..
deniyaya kolawenigama area 1ta 3g signal na.pallegama ehata 3g signal na.korea wala witharak 100k withara innawa.3g call ganna ba.pls hadala denna.oyalage custermasla gana godak wadiwei.mama aurudu ganaka idala hutch use karannepls attention this problem.